Today, we are excited to share a new children's book in our book spotlight along with a guest post from the book's author! 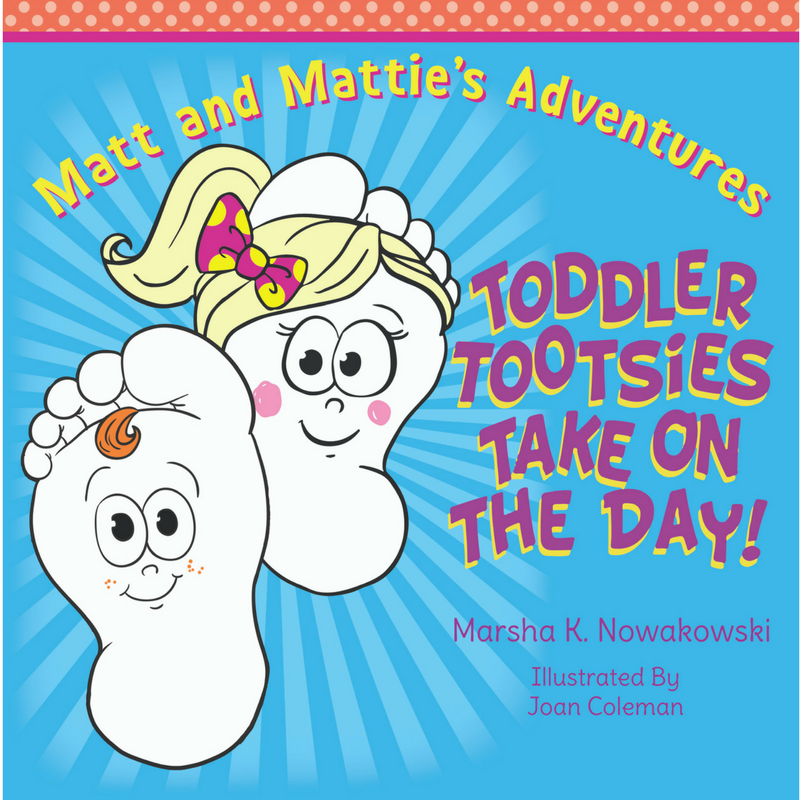 Check out Toddler Tootsies Take on the Day, learn about the author's inspiration for this book as Marsha Nowakowski shares a guest post--and be sure to enter for a chance to win a prize in the book tour giveaway at the end of this post! Where did you get the inspiration to write Toddler Tootsies Take on the Day? 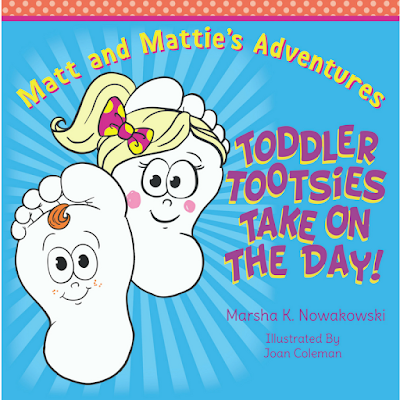 My debut book of Matt and Mattie’s Adventures: Toddler Tootsies Take on the Day started as an idea almost 2 years ago. The idea to write a book developed over a cup of coffee I had with a few of my girlfriends discussing life in retirement years. My friends encouraged my timid and hidden dream of writing. Since I already had developed and published creative projects at the hospital where I worked, I thought, “Why not put my efforts towards a passion I truly had for use in my retirement years?” Working as a cardiac nurse and taking care of other hearts, I finally felt the time was right to follow my own heart! As my toddler book idea further percolated in my mind, it really brewed after my first granddaughter was born. Wow, do grandchildren inspire us! Seeing the determination toddlers exhibit in learning difficult lessons in life such as walking and trying to learn daily routines, I saw an opportunity to draw from my health background, wanting to make a difference in the next generation…our future! Many years of observation and experience proved to me that patients who recovered more quickly were those who exhibited healthy daily routines and had a good attitude towards life no matter their obstacles or challenges. As a grandma with a new outlook on parenting I realized the need for teaching healthy habits to youngsters as early as possible to help them become successful and always be able to do their best! This needed to be fun and something they could relate to themselves! Learning their ABC’s and numbers were hardwired in school, but I wanted to create a book with diversity that would make multiple everyday habits fun, balanced, and even adventuresome for toddlers. So it was my true conviction of healthy children and a healthy nation that inspired me to write Toddler Tootsies Take on the Day! This is Marsha’s debut book for toddlers. She has spent forty years in the healthcare industry, primarily as a cardiac nurse. Her inspiration for writing Matt and Mattie’s Adventures developed from her own observations that patients who recovered more quickly exhibited healthy habits and good attitudes toward life. As a mother and grammie, Marsha recognized the need for books teaching healthy habits to help young ones develop into successful people who always do their best. Matt and Mattie’s Adventures makes everyday habits fun, balanced, and adventuresome for toddlers. 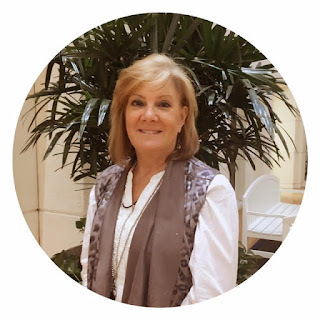 Marsha’s own adventures include travel, horseback riding, and reading. She also enjoys golf, baseball games, and sailing with her husband. According to Marsha, every day is an adventure!